into American homes, eventually familiarizing Westerns to the point of contempt. This is a superb book, a must for anyone interested in the western and its relationship to the development of society. Coyne clearly admires Phillip French’s “Westerns” although he is implicitly critical of French’s very specific analysis, something with which I concur. Nevertheless he recognises the contribution French has made by raising the question of the relationship of the production of a film to the political background of the time in which it was made. Both books are admirable and their authors are incredibly knowledgeable of the whole genre. Just as Michael Coyne recognises Phillip French’s “Westerns” as a ground breaking work I think this is also true of “The Crowded Prairie”. Coyne’s analysis is strongest when the background is clear and unequivocal. The Vietnam War had a massive impact on American Society and his chapter dealing with this time period is particularly impressive. The McCarthy era, too, is distinctive and clearly directly relevant to the film industry, and as such, is representative of the anti Communist scare in the USA as a whole. What is particularly engaging about this work is that Coyne has favourites: The Wild Bunch and Warlock, for instance, and to an extent he drops his academic stance when dealing with them. This is a monumental work, made all the more fascinating by the inclusion of excerpts from reviews written by film critics at the time the films were released. 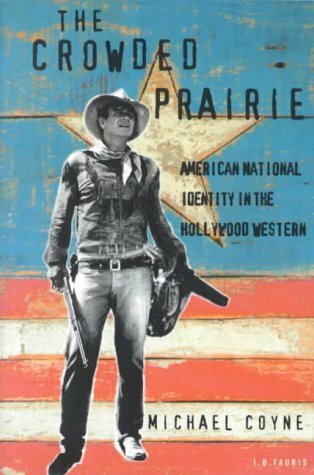 Coyne is so wedded to his thesis, that “The Western” cannot include the work of Siergo Leone, despite the fact that Leone’s films were extremely influential, and he even accuses the sacred cow of Westerns Clint Eastwood of “bastardising the genre”, helping “to take the heart out of the western”. This is somewhat ironic when one considers his eulogy of “The Wild Bunch”. This causes him to effectively finish “The Western” with the death of John Wayne, which in, my view ignores the fact that it has lived on, albeit in a less central form to the medium as a whole. Perhaps the problem, if there is one, is that he is so centred on the western that he either plays down or ignores the influence of other media, except television, and does not really locate the genre to movies as a whole. Specifically, I would suggest that the influence of radio, which developed concurrently is ignored, at least I couldn’t remember anything. More importantly, perhaps the prevalence of the West as a setting for stories to be told during the fifties and sixties was a reflection of the lack of imagination of scripts and the stage of technological development and how this was reflected in audience expectations. To put it crudely, films are very much a reflection of their time and tell us far more of the prevailing attitudes and values than they ever can about the truth or otherwise of the subject matter. Westerns are no exception and are just part of that whole and not a separate entity. To put it even more crudely, if they were making Westerns of a particular type they couldn’t be making other films. This is not to devalue Coyne’s work for it must be clear that I am in awe of its magnitude and the depth of analysis. It is just that separating out a genre is an analytical tool, and Michael Coyne is so passionate about and consumed by his study that he seems to view Westerns as a separate entity from other film genres within the medium. As he himself suggests, thrillers, cop movies, road movies can all rework themes featured in the western. If in fact the genre was to be labelled "odyssey", a category which Coyne juxtaposes with "community", Thelma and Louise would line up with westerns like Dances with Wolves. I reckon "Out of Sight",Soderbergh, 1998 is a reworking of the western, complete with the shoot out at the end. It is a long time since I have read such an intellectually stimulating and intriguing book. I would have been interested in an informed opinion of how much the financial backers influenced the subject matter and values of the films produced by big companies.